HomePlug AV standard compliant, high-speed data transfer rates of up to 200Mbps. 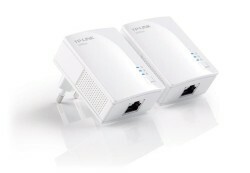 Twin Pack design helps establish a basic powerline network. Miniature design, smaller than most powerline adapters at the market, blends discreetly in front of any power outlet. No new wires, Easy Plug and Play operation, No configuration required. Patented Power-Saving Mode automatically reduces power consumption by up to 75%*. Operating temperature 0-40 C. deg. Price: 150.00 PLN / pcs Price: 36.89 € / pcs Add to the basket.